These are the last two murals from O+festival 2018. Art by Lucinda Yrene Hinojos aka La Morena at Lite Brite Neon, 26 Downs st. Kingston, NY. Art byDina Kravtsov and Mat Schulze at Radio Kingston Annex, 693 Broadway. I think that is the last of the O+festival mirrors until fall. Family of Woodstock Darmstadt Shelter 40 Thomas st. Some finished pieces form this years festival. Art by Samantha French and Aaron Hauck at Keegan Ales 20 James st.
Art by boogieREZ at Eddys Restaurant 742 Broadway. Art by Lindsey Wolkowicz at Anne Heard School of Ballet 795 Broadway. This piece is in a covered walkway and very difficult to photograph. The images are directly across from each other. This gives a sense of the space. Golden Artist Colors are one on the sponsors of the festival. This years theme was reflection. Art by Will Lytle aka Thorneater comics at Citizens Bank building 273 Wall st. He has two other murals in Kingston which I will post in the future. Art by Kimberly Kae – Bilancia – Birch Body Spa, 73 Crown st. 2013. This mural covers the whole side of the building so this is a very small part of it. Geddes Jones Paulsen and Randiel Sanudo – untitled – 309 Fair st. 2011. Art by Tani Ikeda, Jess X. Snow and Layqa Nuna Yawar – Survivor Love Letter – at Family of Woodstock Darmstadt Shelter, 40 Thomas st. Finished art by Jess X. Snow from O+ 2016. Art by Jess X Snow with Jia Sung – Mothers of Invention – at Artbar, 674 Broadway. This is from 2017. I love that they matched their garden and chairs to the mural. Art by Nanibah – Nani- Chacon -We’ve Always Found Our Way Home – at The Brush Factory, 107 Greenkill Ave.
Art by boogieREZ at Eddys Restaurant, 724 Broadway. Art by Lindsey Wolkowicz at Anne Hebard School of Ballet, 795 Broadway. 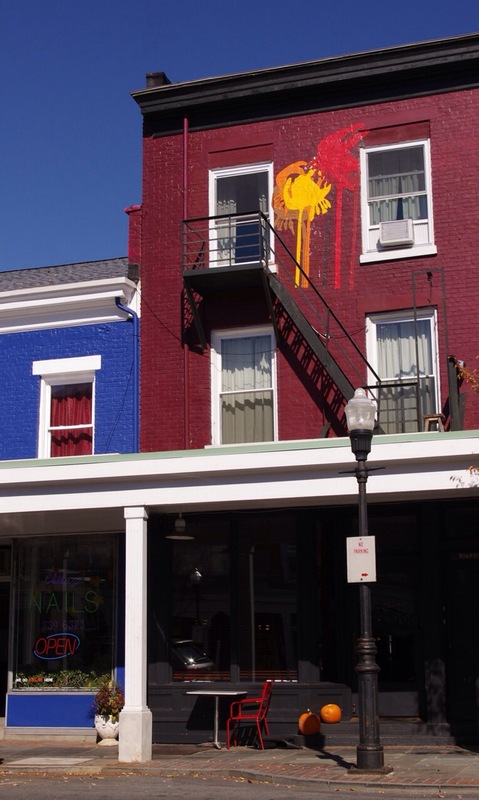 Art by Samantha French and Aaron Hauck at Keegan Ales, 20 Saint James st. (Prospect st. side of the building. This one is also behind the Kingston Y.
It’s from the 2017 Opositive festival so I don’t have the artist info, except for the signature – V Ballentine – on the lower left. Sorry it’s been a bit, I’ve been ill. I’m on the mend now so have some more street art. These two are from Opositive festivals in 2014 and 2015 respectively. This is on the back wall of the Kingston Y. Not too far away on the side wall of Joe Beez is S.W.A.K. by Keith Carollo. There is a companion S.W.A.K. on the other side of town but I don’t have a shot of it, maybe soon……. Kingston’s O+ (positive) festival had beautiful weather, a great farmers market and probably a lot of good music. I go for the street art. 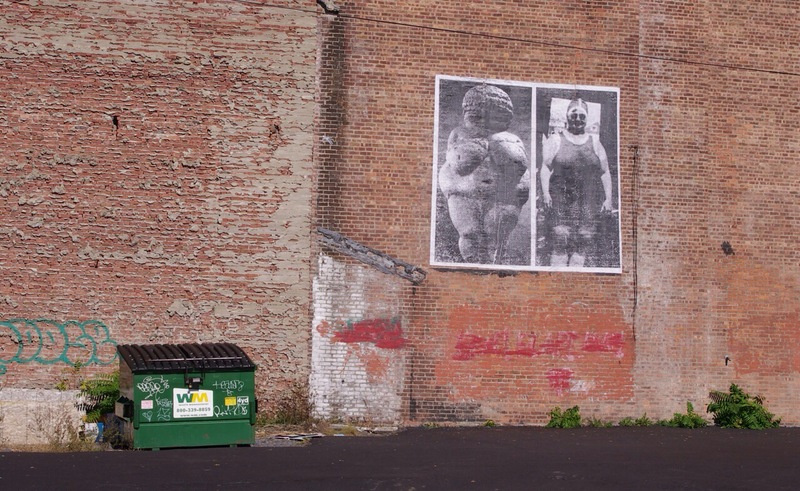 In case it is not apparent in the photo the left side of the paste up is the Women of Willendorf, aka the Paleolithic Venus figurine we all should have seen in art history 101. I don’t know who the sunbather on the right is. 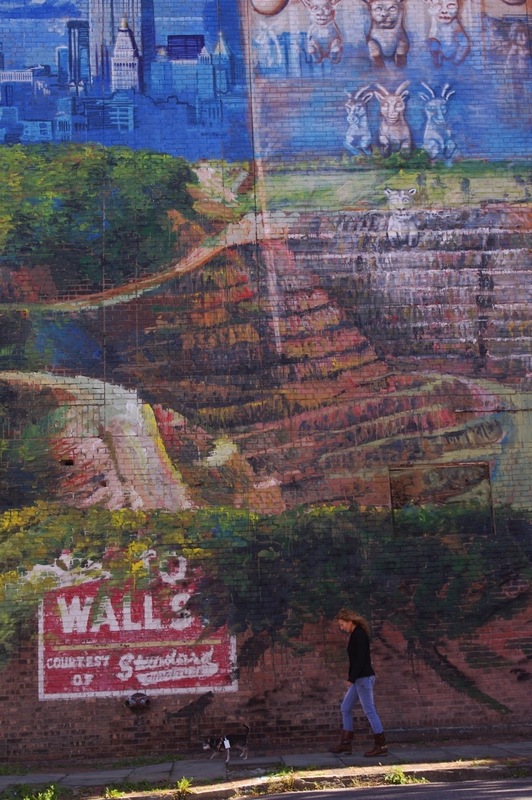 The mural is huge, with a multi breasted Aphrodite sculpture rising up out of a gorge….it’s complicated, lots of symbolism, etc. This one is a brilliant bit of color, other than that I’m clueless, but it’s fun. Sorry that I don’t have the artists’ name, but you can link to the web page O+. I took some photos last year, I’ll go back and see if any are worth posting.